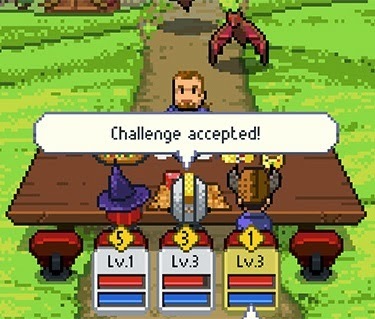 Unquestionably, Knights Of Pen & Paper is one of the most popular RPGs in the mobile circuit. For the five of you who haven't played it, it's a game which attempts to crowbar tabletop role playing into your iPhone, which only makes less sense the more you think about it. Much like Dungeons & Dragons, you play as a party of five adventurers who get into all sorts of quest doings. Killing this, going there, collect that. If you've ever played any sort of role playing game, you know exactly what to expect. 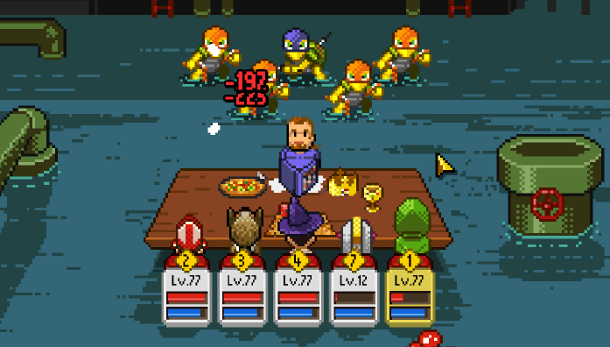 But Knights of Pen & Paper differs from the norm in that it is "the ultimate pen & paper RPG simulation experience." While it could be argued that Planescape: Torment or Baldur's Gate are actually the ultimate pen & paper RPG simulation experience, Knights of Pen & Paper certainly feels a lot closer to the tedium of sitting in your friend's mother's basement. There's an attempt to integrate the d20 system by way of dice rolls. For example, in dungeons when resting the game will roll, and depending on that outcome, you'll be allowed to rest or have to fight. While occasionally frustrating, it certainly adds a nice element of tension to the game. It could be said that Knights of Pen & Paper certainly doesn't go far enough in the direction of table top gaming. 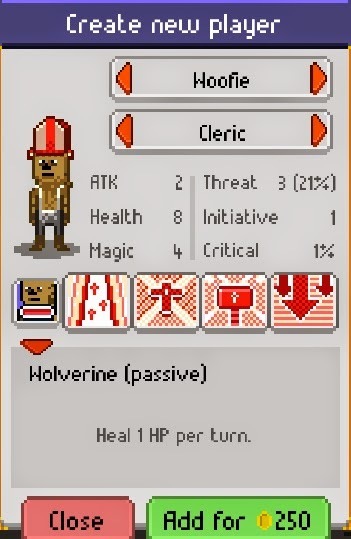 Despite the inclusion of pony-tailed dungeon master (who you have the option of swapping out as the game progresses), the game certainly feels much more reminiscent of the filthy JRPG world with its colorful retro-pixel graphics currently plaguing the landscape of the indie games market. Though, I wouldn't be able to tell you how it compares to a real game of Dungeons & Dragons considering I bathe myself on a regular basis. Combat is fun and efficient with a surprising amount of depth. Though the game lacks character creation, you have plenty of spells and skills to take advantage of thanks to a wide range of classes. Paladins, mages, knights, bards, there are plenty to play as. Each have their own traits and you're free to swap characters out at taverns which is helpful if you're interested in prolonging your game as long as possible. And prolong your game you will. With a wide array of dungeons to traverse, the game is far more involved than one would expect. While the story isn't anything new, it is much more engaging than most of what's available for mobile devices. Though, that isn't saying much considering the competition. Though, the story is the least important part of the game. While there is a main quest to finish, you aren't required to pay attention to it. Which is good because while it isn't awful, it certainly isn't Tolstoy. But no one plays RPGs for the stories and thankfully if you are so inclined, you can simply click through it. Best of all, the game features little to no random battles. That's not to say that they aren't there, but they're only in very specific parts of the game. Typically when you're resting in a dungeon or during a quest. Most grinding - and there is plenty of grinding - will be done at your leisure. 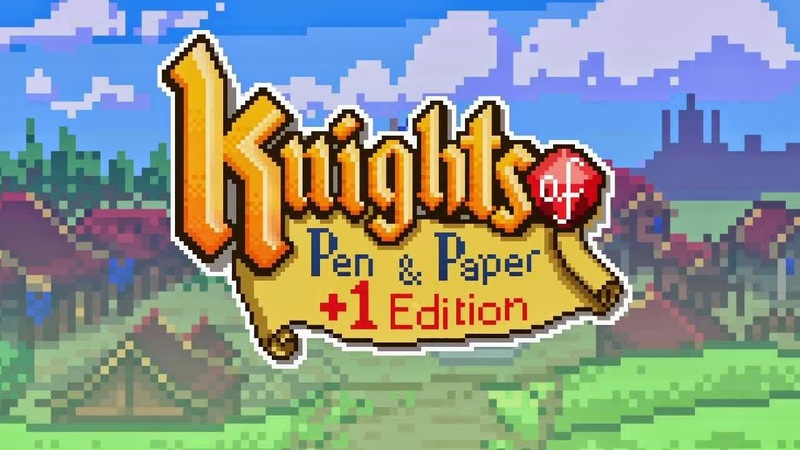 Admittedly, Knights of Pen & Paper probably won't be for everyone. While the game makes a great attempt to bring classical RPG mechanics into a new setting, fans of the d20 system may be left feeling underwhelmed by the simple story and game play. Though there is plenty of fun to be had for those looking for a less involved alternative to Final Fantasy.